One of our favorite things about fall is a well-made apple pie. You’ll find all manner of apple varieties at the farmers market—from the sweet and tender to the tart and firm—but fresh, seasonal fruit is only one ingredient in a knockout pie. What separates pedestrian pastry from a prize winner? We asked four local experts how to take pie baking to the next level: Rebecca Courchesne, the chef behind Frog Hollow Farm’s jams and pastries; Anna Derivi-Castellanos, partner at pie pop-up Three Babes Bakeshop (with Lenore Estrada); Jen Musty, owner of Batter Bakery; and Mimi Young, executive pastry chef at Rebecca Jean Catering. They’ll all be judges at CUESA’s Harvest Festival Apple Pie Contest tomorrow, so contestants, consider this your cheat sheet. Courchesne: I like simple pies. Having really good quality fruit is the main thing. Make sure it has the right ripeness and sugar-acid balance. Some apples aren’t great for baking; for example, I don’t like to bake with Fujis. And of course, you need a really wonderful pie crust. There’s a period of three or four hours after you take it out of the oven where the crust is at its optimum and the filling flavors are just beginning to meld and taste good. Derivi-Castellanos: The perfect pie is the perfect marriage between a buttery, flaky crust and a sweet-tart filling. With apple pies, I’m really interested to see how people can be classic yet creative. But I don’t mind being served a straightforward, delicious apple pie either. Musty: I look for an awesome crust to start—something that melts in your mouth when you take a bite of the pie—and the best seasonal filling you can find. I’m a big fruit pie person. 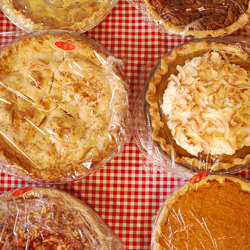 Pie is something that is very fall-ish or summer-y, bursting with the flavors of whatever’s available at the market. The smell of apple pie in the fall should entice you into the season. I also like a great topping, whether it’s double crust or crumb. Young: For me, it’s all about the crust. I like using leaf lard in my dough. It’s very forgiving and makes the dough flaky and tender. Do you have any pie pet peeves? Courchesne: I don’t like when the fruit’s undercooked, like when there are big hard chunks of apple in a pie, but I don’t like it to be mushy. I like to see the shape of the pieces, but they’re still soft. Derivi-Castellanos: People tend to use pie pans that don’t conduct heat well, or are too large or deep or have a scalloped edge along the side because they look pretty. You’re really doing yourself a disservice because it’s not going to bake the bottom of the crust correctly or allow you have a nice edge along the rim of your pie tin. Stick with your straightforward glass, stainless steel, or aluminum pie pan. Musty: Too much sugar. I prefer pies on the tarter side, and I hate when the filling has an almost corn-syrup-like consistency. I think the worst thing you can do to a pie is to put so much sugar that the flavor of the fruit is totally disguised by that sickeningly sweet taste. Young: Bad or tough crust or filling that is too liquid or mushy. I also don’t like when there’s a gap in the pie crust. As a pie bakes, the filling shrinks, so I like to partially cook my filling before I put the pie together because it thickens the juices, and you don’t wind up with a gap under the top shell. Any pro pie crust tips? Courchesne: Find a crust recipe you’re comfortable baking with. After you make the dough, let it rest for about two hours before you roll it out. That allows the flour to absorb some of the moisture, which will help when rolling it out. I used to use my hands to mix the butter into the flour, but now I use a food processor, and the dough comes out perfect. Derivi-Castellanos: We always try to remind people that baking pie takes time, and cutting corners doesn’t work out in the end, particularly when it comes to letting the dough rest. Every time you touch the crust, you’re developing the gluten. Pie baking is the exact opposite of how you make bread. You knead bread dough because you want it to be chewy. You don’t want pie crust to be chewy; you want it to be delicate and flaky. Musty: People have a tendency to overwater their crust, which creates a chewy, gummy consistency as opposed to that flaky, shatteringly tender consistency you want. Keep everything super cold so you’re only adding as much moisture as you need. Young: When letting the dough rest, I think it’s helpful to flatten it out into a ½- to 1-inch disc instead of a ball before you refrigerate it. It makes it a lot easier to roll it out. 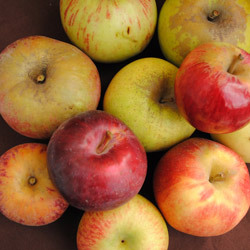 What are your favorite apple varieties for pies (when available, of course)? Courchesne: Pink Ladies, Spitzenbergs, Ashmead’s Kernels, Belle de Boskoop (in combo with others), Gravensteins. Derivi-Castellanos: Granny Smiths, Jonathans, Gravensteins, Pippins. We enjoy doing mixes of apples, like one that is really hard and tart with one that is really sweet and juicy. Musty: We often use Rome Beauties, Pippins, and Granny Smiths—usually a mix of firm and soft, depending on what’s available. Young: The varieties I like can be hard to find or have a short season, such as Sierra Beauties. And Mutsus are a just great all-around apple. Pie lovers, tomorrow’s the big day! Submit your pie or root for the contestants at CUESA’s Harvest Festival Apple Pie Contest and watch a cooking demo with Three Babes Bakeshop.